As many of you know I shoot with a Pentax 645Z for a large portion of my work. Prior to that I shot with a Pentax 645D and before that I rented a Phase One back for an old Contax 645 I use to own. Now many of you will of course ask the obvious, why shoot medium format digital today? With cameras available in the 30+MP range that are smaller and less expensive what is the allure that would lead one to medium format? Let me get this clear right off the bat, I have a very strong relationship with Ricoh Imaging, the owners of the Pentax brand. This article was suppose to be a simple white paper on how to get around Capture One for tethered shooting. It was suppose to be quick and easy, but with many thanks to Ricoh and of course much patience and a few revisions this has become something a bit longer. Now back to the question - “Why Medium Format”. As I noted there are cameras by several manufacturers that easily get into the resolution of many medium format units. Cameras by Sony, Nikon, Canon and soon Pentax as well all have “full-frame” options that reach into the 30+ mp range. Resolution must therefore not be the driving reason for the desire to shoot medium format. What could it be? In the image above you see three shots side by side using different cameras and their respective “normal” lenses. Each uses a different sensor size and have the identical field of view. 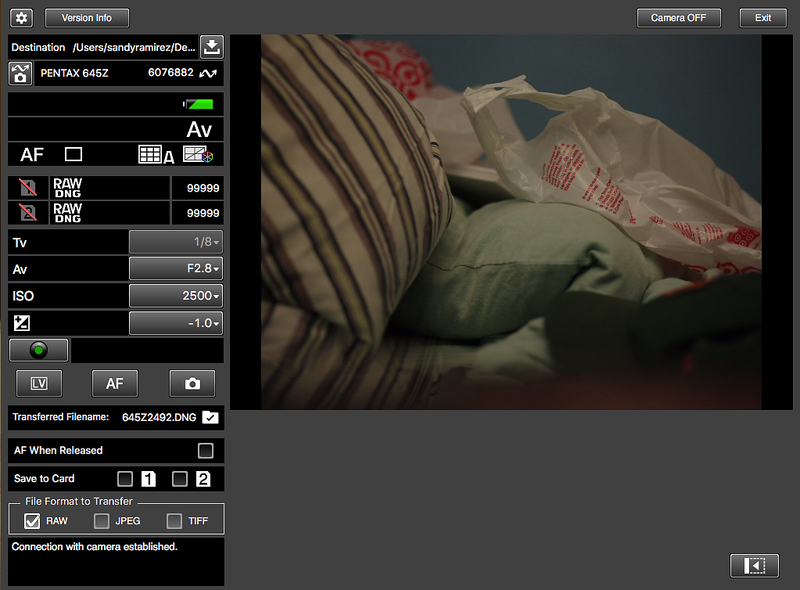 In all the shots the ISO and aperture are identical as well as the FOV. Yet in each the DOF is vastly different, getting shallower with each increase in sensor size. Why is this? Focal length is the answer. 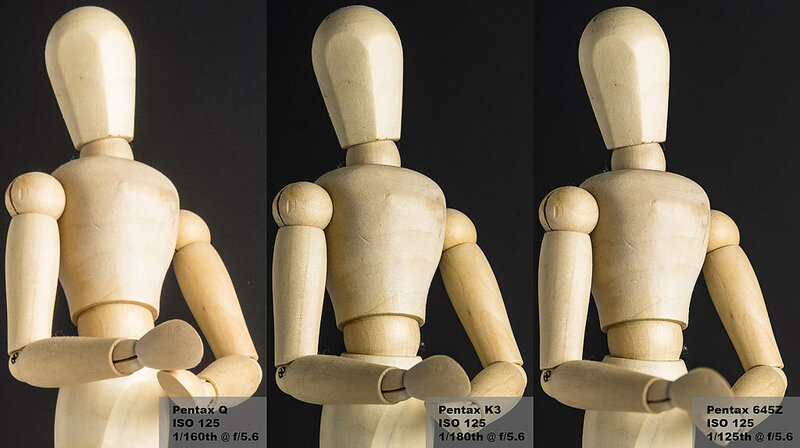 On the far left is a shot using a Pentax Q with it’s 8.5mm f/2.8 lens, next to it is a shot from a Pentax K3 using a 16-50 at 35mm, and finally the Pentax 645Z using a 75/2.8. Even though each of these lenses provides a near identical FOV, the shorter actual focal lengths will have a lot more DOF. You cannot argue with he law of physics. This is why one shoots Medium Format, you use longer focal lengths for the same FOV. Because of this you get better subject isolation and shallower DOF for the same FOV. The penalty of course is you need to be a lot more careful with your focus technique, and of course you can’t shoot rapid fire, willy nilly. The exploit the benefits of Medium Format fully, you have to slow down your approach and take a bit more time. Now let’s move on to the next matter, workflow. When Pentax released it’s first MFD, the 645D, it enjoyed support in Capture One for DNG conversion. One could capture via a workaround into Capture One as well, much like Hasselblad H3D users had to do. Unfortunately Phase One has decided to block DNG support not only for the 645Z, but all Pentax cameras. Since their product is vastly more expensive with far less technology, Phase has decided to block all competitors in an attempt to monopolize the market and take choice away from the consumer. Now for the vast majority of Pentax users this is of little consequence, but for 645Z users this is a major headache. Most work done with Medium Format cameras is done in a tethered workflow model. This is primarily due to the market sector MFD users are in. While the 645Z has expanded these markets and the places one can confidentaly use a MFD, the vast majority of the work still is done in markets where an AD will want a realtime view of what is being shot. Thankfully for us Capture One is not the only solution available. 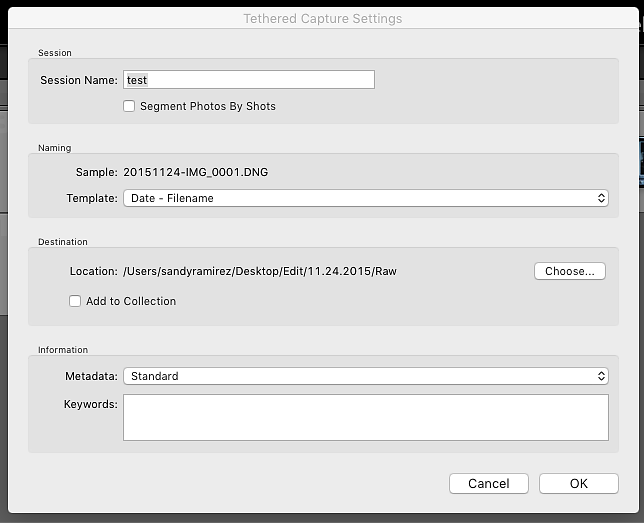 Adobe’s Lightroom CC provides us with two methods to implement tethered workflow. One of these methods also provides the added benefit of compatibility with Lightroom Mobile, thereby allow you to provide an experience similar to using Capture Pilot only without the iOS only restrictions. So let's dive in! This first option is the least desirable of the options available. It is basically similar to the old “watched folder” work around in previous versions of Capture One. The application is Pentax Image Transmitter 2.0. This version of the package does provide an image preview and allows you to fully control the camera as seen from the screenshot below. One very interesting thing is the LV function that gives you the Live View screen right from the camera. It also allows you to write directly to the memory cards while tethered, and allow you to shoot in TIFF as well as the usual DNG and JPEG formats. What Image transmitter basically boils down to is a quick and dirty way to whether and capture to your computer. The control panel above is the key for what we are trying to do. The section at the top marked “Destination” is where you will choose the folder your captured images are stored. This will be important when we get to Lightroom in the next step. 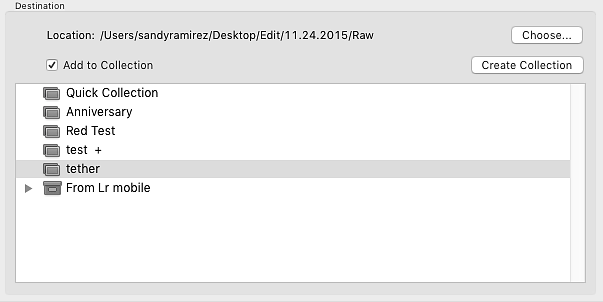 Now the most important thing to remember is that folder must be empty for Lightroom to do what we need it to do. The video below will demonstrate the final steps. The live view feature is the most interesting thing and as you can see includes focus peaking. The only real bad thing here is the fact that one cannot enlarge the window or use the Transmitter Software to also do video capture direct to the hard drive. Another limitation of this method is the fact that in Lightroom I cannot target a Collection. 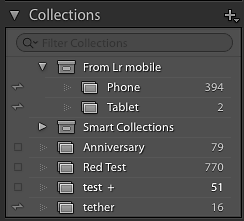 Collections is where the real power of Lightroom in a capture workflow lies. Collections allow you to sync via the cloud to mobile devices such as an iPad or Android Tablet like the Samsung Galaxy Note Pro. While the above does work to capture to a hard drive and as you see in the video above apply a recipe as the images are imported into Lightroom, the limitations on syncing with an exterior device is problematic. Another issue is of course the need to run additional software. The less one has to worry about the better. To that end the folks at Ricoh Imaging worked together with Adobe and created a plugin for Lightroom that allows direct tethered captured. The major benefit of this is that you can send the files directly to a Collection that can be synced with Lightroom Mobile. This allows you to hand the client a tablet and they can watch the image pop up right there. Now granted Capture Pilot does this as well, but Lightroom Mobile goes a few step farther allow not only selection of the images which gets synced back to Lightroom, but it works via the Adobe Cloud, not just WiFi. This allows the client to be remote from the shooting location, hell even the other side of the globe if need be. 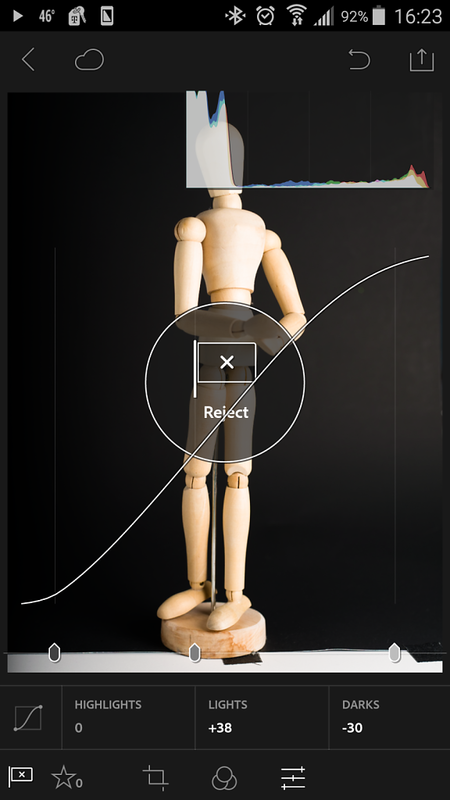 LR Mobile also allows the client, or better their Art Director to modify the DNG development recipe and have those changes updated to whatever the photographer is shooting. Unlike the Transmitter Software, the options are far more limited for camera control. Outside of the big silver button to fire the camera, the control panel only shows the information that you have set on the camera itself. usually I first create a collection for the shoot and make sure that I have it sync with LR Mobile. On the Collections Panel this is represented by a small double ended arrow to left of the collection name. Once Capture occurs the images are transmitted immediately to LR Mobile allowing the client to select and of course if they are capable make needed adjustments to the photos and have those elections and adjustments sync back to the host computer. The video below show the full process. Feel free to ask questions below in the comments.